Pompey kept up their unbeaten start to the League One season with a 1-1 draw against Shrewsbury on Saturday. However, the Blues were well below their best against John Askey’s side and their performance was the opposite to the previous weekend’s win over Plymouth. 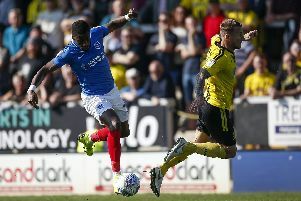 Brett Pitman rescued Pompey a point with an 87th-minute penalty, cancelling out Greg Docherty’s opening goal. Not the best performance from #Pompey this afternoon, but I think it’s harsh to be picking out individuals. Players make mistakes. We’re still unbeaten so far and for me that’s all that matters!